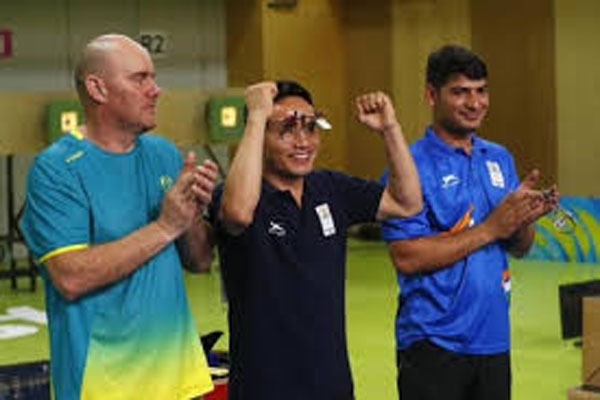 Gold Coast(PTI): Indian shooting ace Jitu Rai claimed the gold medal in men’s 10m air pistol event by creating a new games record while compatriot Om Prakash Mitharval bagged a bronze at the 21st Commonwealth Games here today. Rai continued to surge ahead with a 10.2 but an 8.4 disturbed his momentum somewhat, as the next shot fetched him 9.2. Meanwhile, Mitharval closed the gap as Rai had just 8.8 in the 18th shot to Mitharval’s 10.0. However, Mitharval slipped after that even as Rai managed another 10.0 and maintained the lead throughout to emerge triumphant.